Now that school is out and kids are off to camp, are you looking around your house and wondering where all of the water bottles, hooded jackets and that extra pair of sneakers disappeared to? 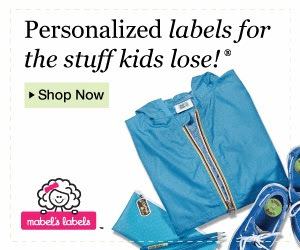 Get a jump on the back and forth of belongings before school starts up again, and take advantage of Mabel's Labels Back-to-School early bird pricing. Whether you select the bestselling Mabel's Labels Ultimate Back-to-School Combo or the new Mabel's Labels Stylish Scholars Combo , you'll receive 108 tags that are UV resistant, waterproof, dishwasher and microwave safe—perfect to track everything from tablets to bento boxes. And, if you purchase in July, you spend only $39 per combo pack (regularly $42). Take advantage of Mabel's Labels Back-to-School early bird pricing and secure yourself some peace of mind before the school year begins.